I am not an addict, although sweet tea comes really close for me. I will not pretend to be an expert on addiction. I know enough to know that addiction is hell. However, I do live with an addict in my sports life. 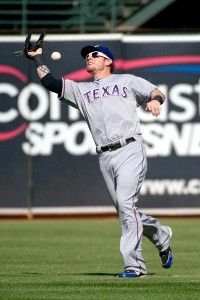 His name is Josh Hamilton. He left me for a couple of years, thinking there was more out there for him than me. Now, suddenly Josh is walking back into my life. And as a Texas Rangers fan…I am conflicted. Just before Christmas, they found their new centerfielder when they traded prized pitching prospect Edinson Volquez to Cincinnati for Josh Hamilton. Hamilton finally made it to the big leagues in 2007 with the Reds, after years where great promise succumbed to near-fatal addictions. While sabermetricians predicted good things for Hamilton hitting in The Ballpark in Arlington, Ranger fans boned up on his backstory and hoped for the best. And wow, did we ever get the best. I had a late business meeting in downtown Dallas the night of the 2008 Home Run Derby. I’ll never know how I drove home safely that night, because tears rolled down my face the whole way as I listened to Hamilton’s performance on the radio. As ball after ball landed in the farthest reaches of Ruth’s House, and Yankees fans cheered, I could not help feeling joy for Josh realizing his God-given potential on a national stage. 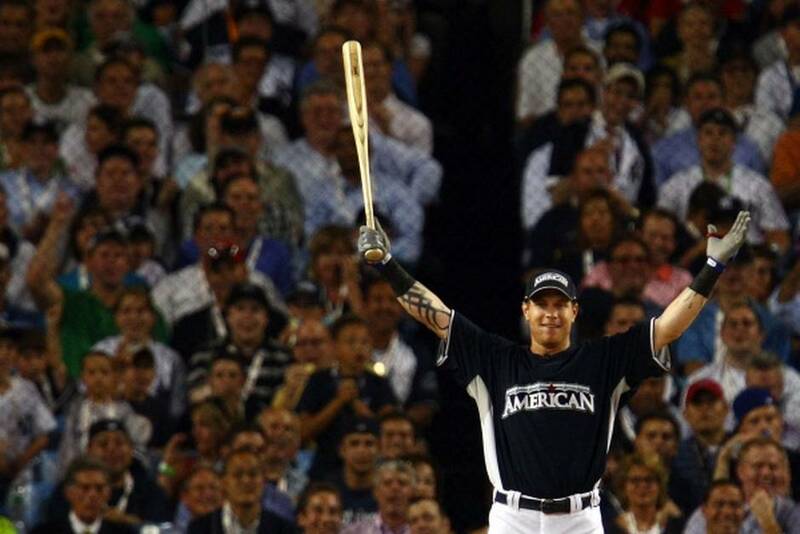 Swear to God, we could have gotten anything the Yankees had if we had offered them Josh Hamilton the next morning. The Rangers still were not very good yet, but Josh had a great year. He settled into the area, shared his Christian witness with church youth groups, and quickly became a fan favorite. He hit baseballs a helluva long way and he threw his body all over center field with abandon. He provided electric moments and incredible memories for five seasons at Rangers Ballpark. Occasionally, I listen to Eric Nadel’s call of the walkoff home run Josh hit on July 9, 2011. That was two nights after fan Shannon Stone tragically fell to his death while reaching for a ball Josh tossed to him and his son. That homer, that healing moment in time, still gives me chills listening to it today. The video below is from the television broadcast. What a moment it was. From 2008 – 2012, Josh Hamilton was a baseball beast. Of course, when we got Baseball Beast Josh, we also got the other Josh. Snarky Josh with the media. Silly Josh at Maloney’s Tavern. Crazy Josh at Sherlock’s. Whining Josh who blamed his hitting slumps variously on energy drinks, quitting tobacco, personal sin, day games, and his own blue eyes. THAT Josh. Recovering Addict Josh. 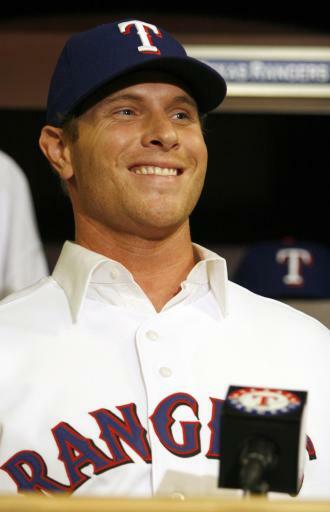 For five seasons, Josh Hamilton was the greatest player in Texas Rangers history. He also was our most fascinating character, a volatile mix of testosterone, ego, moodiness, self-doubt, and relapse potential. He played with a youthful abandon on the field, yet sometimes displayed juvenile behavior off the field. Josh’s party in Texas ended in September 2012. A hitting slump became protracted. In the last game of the season, with the AL West division on the line, he dropped a crucial fly ball in Oakland. When he failed to produce at the plate in the Wild Card game, Rangers fans turned on him and booed lustily after each at-bat. The Rangers lost to Baltimore that night, and the free agent outfielder took his high-wire act to SoCal. There, he sealed his fate with Texas fans when he famously declared that Dallas-Fort Worth is “not a baseball town.” He was right, of course, but it still was a cheap shot at Ranger Nation. Fans dissed him loudly whenever the Angels came to town. Soon, Hamilton also lost Angels fans, as his hitting troubles continued and his body began to give out on him. Off the field, his marriage unraveled. When he admitted to MLB a still-mysterious relapse of his addictions last February, his Anaheim situation completely tanked. Owner Arte Moreno could not wait to dump his highly-paid player, believing the relapse was disloyal to his benevolent ownership and toward Hamilton’s teammates. Texas answered Moreno’s call. That is how Josh Hamilton ended up on my doorstep, knocking sheepishly and wanting to come home. Addiction knows no seasons. When you are on top of the world, feeling secure and invulnerable, the addiction feeds on that. When you are down in the dumps, feeling unloved and incapable, the addiction feeds on that, too. It’s why addiction is so insidious. It attacks you, no matter your mood, no matter your circumstance. Living with a recovering addict is difficult. It is not a matter of IF they will break your heart again, but WHEN. All of your love and support and counsel cannot make the addiction just go away. You never take the good times for granted. You pray the bad times are not too bad. 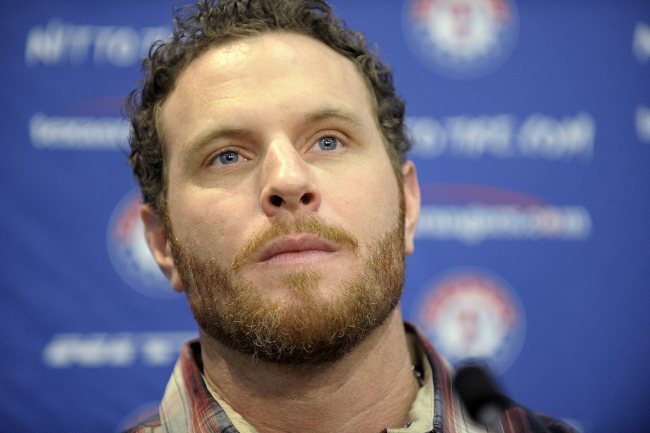 Sometime in 2012, Josh Hamilton lost his mojo. Baseball came so easy for Josh from childhood on, but now he scuffles around, looking for that magic moment when it all clicks into place and he becomes a beast again. Hamilton lives for the cheers and chants—needs them, really—but those are far fewer and much farther apart now. After the latest relapse, Arte Moreno wanted Hamilton to grow up, man up, and stop his self-destructive behavior. Moreno may not understand addiction. Josh is not stupid, immature, disloyal, or intentionally self-destructive. He is an addict. Every skill, every decision, every emotion, every relationship is at risk every minute of every day from the addiction. Addiction is not an excuse. It is a driving force. 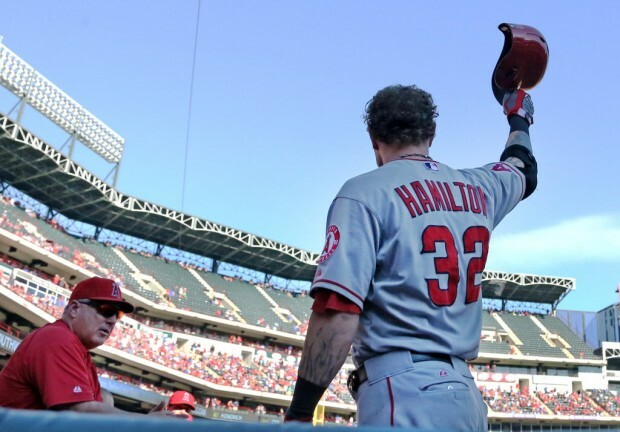 Josh Hamilton will never be a Baseball Beast again. He did not find the formula in Anaheim. It appears he may have started remembering the formula during rehab stints in Round Rock and Frisco. Can he help this 2015 Rangers offense? Sure, but only because this offense is So. Freaking. Awful. 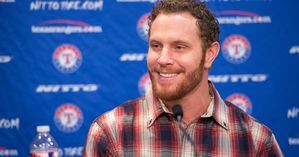 Simply put, Josh Hamilton touches my heart. After all, this is not Alex Rodriguez or Barry Bonds, two cruddy personalities who screwed royally with the integrity of the game I love. He is not Josh Brent who killed a man, or Ray Rice who cold-cocked a woman. He is not Floyd Mayweather, thank God, a pathetic excuse for a man. Hamilton is not a stain on civil society or on the game of baseball. Josh Hamilton is merely a fallen human, a kid in an adult’s aging body who just wants to play baseball like he thinks he still can. I root for him because I’m fallen, too. We all are. He wants to be better at life, and so do I. I want him to succeed, not just as a Texas Ranger, but much more importantly as a man. I want him to succeed for his kids and for the kids who wore his last name on their backs for years. Mine are not the ramblings of a sentimental sap pining for days past. I know what I’m getting myself into as Josh returns to the Rangers. Hamilton will piss me off sometimes. He may get on a hot streak and thrill me for a week or two. I’m ready for both, if it means that the guy underneath the uniform gets a little more sober and a little more healed. I listened to his April 27 press conference when both Joshes took questions from reporters. Baseball Beast Josh got testy over the pointed queries about his aborted time in Anaheim and what he can possibly give Texas on the field. Recovering Addict Josh talked openly and unashamed about his need for control, having people around him who love him and try to protect him from himself. Cockiness mixed with concession. Good grief, it all felt so familiar. When I met my wife, she knew nothing about baseball. I took her to her first major league game in 1994. Over the last 20 years of following the Rangers with me, she has loved only two players: Ivan Rodriguez and Josh Hamilton. She still has her Josh memorabilia, even though that dumb “baseball town” statement ticked her off. She roots for him, too, so much so that she got emotional as I read her this article. I’ve seen Josh play a few times at the Ballpark since he joined the Angels. I never once booed him as thousands of others did. 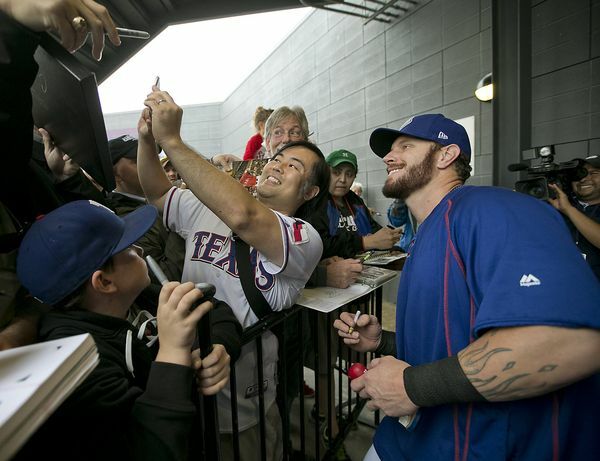 Josh Hamilton played a huge role in a magical era for Rangers fans, and for that he always will have this fan’s gratitude and ongoing support. So if returning to Arlington helps you on your journey, Josh, then welcome home, brother. Have some iced Gold Peak with me. My door is open. Even so, you will break my heart again. I know it. It’s just a matter of time. Bobby Quinten is a Contributor at The Scoop. Follow him on Twitter at @BobbyQuinten.